I know, with plays like “Killer Joe” and “Great American Trailer Park Musical” in town recently, I did a double-take too thinking this play was called “The VioleNt Hour.” But not the case, it’s much more tame and intriguing than that, referring to that moment of dusk when the sky becomes awash with purples, reds and yellows- “The Violet Hour,” the latest effort at Max and Louie Productions. This is the name of a book written by young Denis McCleary, friend and college pal of newly established book publisher, John Pace Seavering. He’s anxious for his friend to get him published but the tome fills over three crates of typewritten pages. The reason he’s so desperate is his girlfriend from a well-to-do family needs to impress said parents that she’s not marrying a ne’er-do-well. But John is also secretly dating a significantly older African American singer who has written her memoirs about her life in a family of sharecroppers. He can only afford to publish one book at this time with his fledgling business so this becomes the crux of a much larger and more complicated series of events that unfold. Add the manic young assistant to the publisher, Gidger, and you’ve got enough dramedy for one play. Oh, and by the way, this all takes place in Manhattan in 1919- a very significant part of the story. 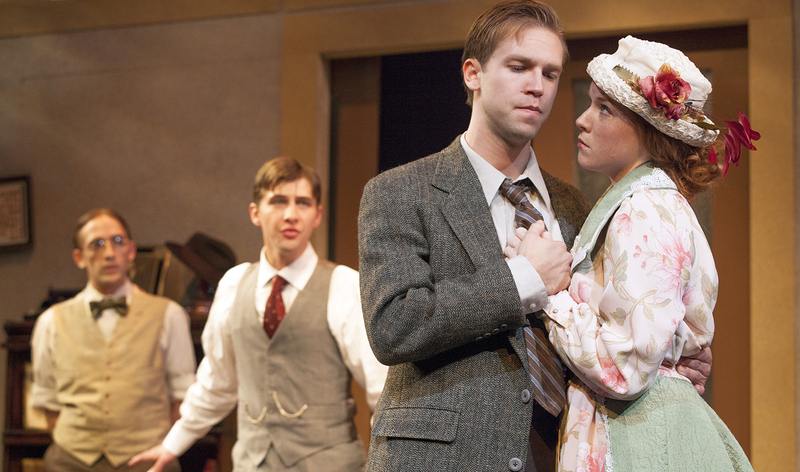 Monica Parks consoles Drew Pannebecker during Max and Louie’s production of “The Violet Hour.” Photo credit: John Lamb. As John, Drew Pannebecker is outstanding. He is grace under pressure but gets thrown for a loop when circumstances are revealed through this unusual machine. His assistant, Gidger, is given an perfectly controlled manic performance by Antonio Rodriguez. Not many actors could pull of this character quite as effectively as he does. Jake Ferree is superb as the buddy- he spews off the astute dialogue worthy of an Ivy League grad but also lets the basic instincts take control when describing his fiance. 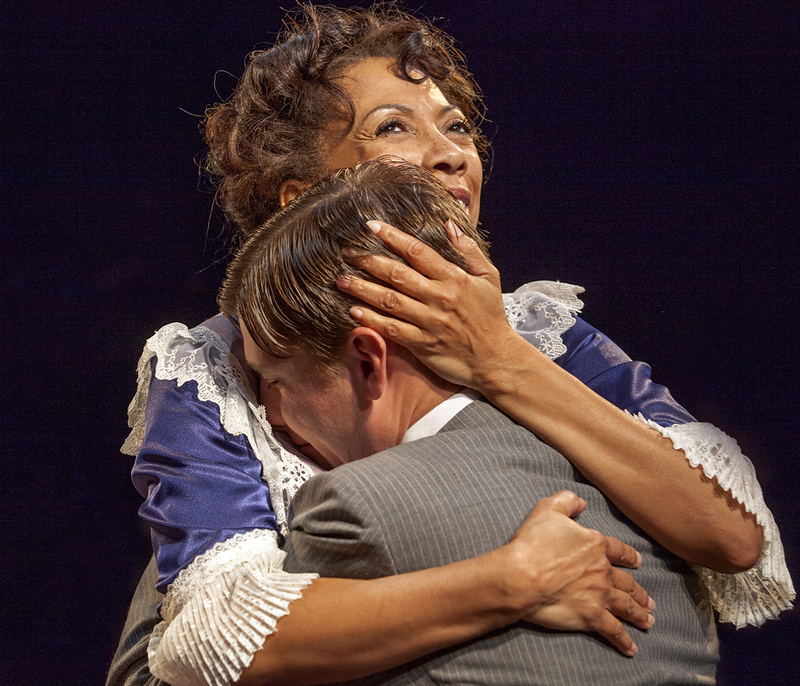 As that fiance, Betsy Bowman turns in a divine performance and Monica Parks is perfect as the renowned singer with obvious grace and charm. Antonio Rodriguez, Drew Pannebecker, Jake Ferree and Betsy Bowman in Max and Louie’s “The Violet Hour.” Photo credit: John Lamb. Sydnie Grosberg Ronga keeps it all moving at a solid pace and makes the outrageous plot twists seem all too real. A marvelous set design by Mark Wilson adds to the believability as do the lights of Maureen Berry and the costumes of Ryan Hanson. A special nod to whoever designed the “spewing paper machine” effect. It all comes together in a delightful evening of surprises topped by an A-1 cast that pulls it off flawlessly. 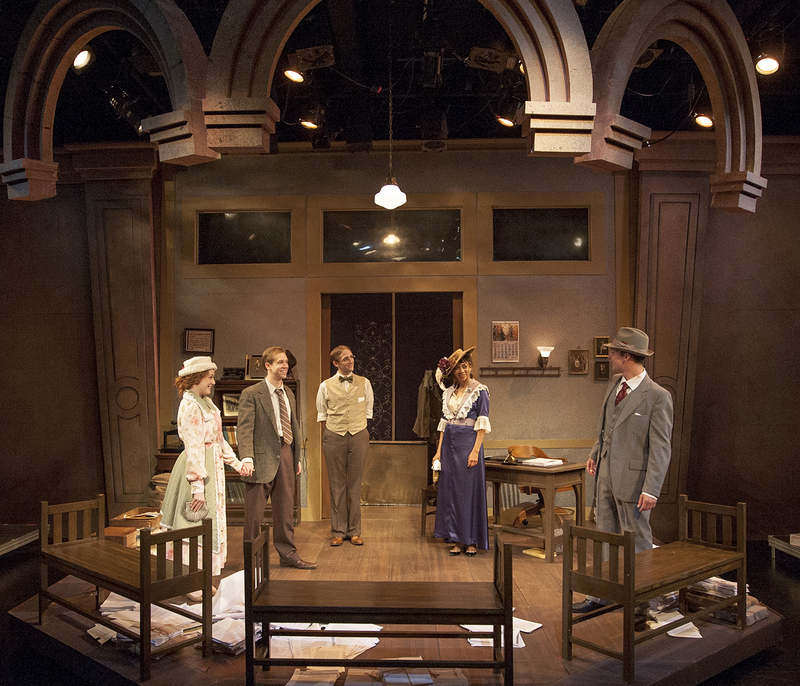 You haven’t got long- “The Violet Hour” only runs through September 2nd at COCA’s Black Box Theatre. So give Max and Louie a call at 314-795-8778 for tickets or more information. This entry was posted on August 27, 2012 at 9:43 am08 and is filed under Uncategorized. You can follow any responses to this entry through the RSS 2.0 feed. You can leave a response, or trackback from your own site.